The Low-Down: A Special Lane For Shoppers Absorbed By Their Phones? A Special Lane For Shoppers Absorbed By Their Phones? Questions have been raised about why people so absorbed by their phones that they dont pay attention to anyone else should receive special attention which only reinforces that behavior. (People) can be seen texting, watching videos and conducting financial transactions, all while dodging cars, tripping at potholes and jamming up subway station entrances. The World Health Organization calls such behavior “distracted walking,” and it is a growing health concern in China, where pedestrian deaths make up a significant number of traffic-related fatalities. So ubiquitous in China are pedestrians glued to their cellphones, they have earned a nickname: the heads-down tribe. In their natural habitat, tribe members can be seen texting, watching videos and conducting financial transactions, all while dodging cars, tripping at potholes and jamming up subway station entrances. The World Health Organization calls such behavior “distracted walking,” and it is a growing health concern in China, where pedestrian deaths make up a significant number of traffic-related fatalities. 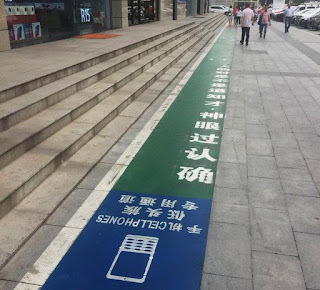 This spring, the managers of a giant shopping mall in Xi’an, a city in the northwest province of Shaanxi, implemented a novel strategy to protect members of the tribe: pedestrian lanes specifically for cellphone users. Colorfully painted paths outside the Bairui Plaza shopping mall have been designated for walkers who cannot be bothered to look up from their devices. “Please don’t look down for the rest of your life,” one message reads. “Path for the special use of the heads-down tribe,” another says. Though the mall’s owners have taken a tongue-in-cheek attitude toward distracted walking, the dangers are serious. The World Health Organization estimates that around 68,000 pedestrians are killed every year in China. That is more than a quarter of the 260,000 people killed annually in road accidents. Photos of the Xi’an pedestrian path went viral on Chinese social media this week, after an article was published in the Beijing Youth Daily, a state-owned newspaper. Some internet users were dubious that the lanes could keep people safe. One user on Weibo, a popular microblogging platform, argued that the lanes would only increase the likelihood of cellphone users walking into each other. Another user wondered what made mobile phone users deserving of special pathways, typically reserved for the visually impaired. Unlike distracted walking, distracted driving is banned in China. Drivers caught on their phones can be fined 200 yuan, about $31, and be penalized with points on their drivers’ licenses.